NEW YORK, Feb 14, 2015/ — Perhaps because the show was held on Feb 12th, the eve of the release of “Fifty Shades of Grey”, the Duckie Brown Fall 2015 show was channeling Christian Grey as models changed clothes in front of the audience! And, no, it was not full frontal like what happened at Rick Owens show in Paris. Rather, the Duckie Brown models took off their shirts showing off those gorgeous abs while they kept their pants on, just like Christian Grey. 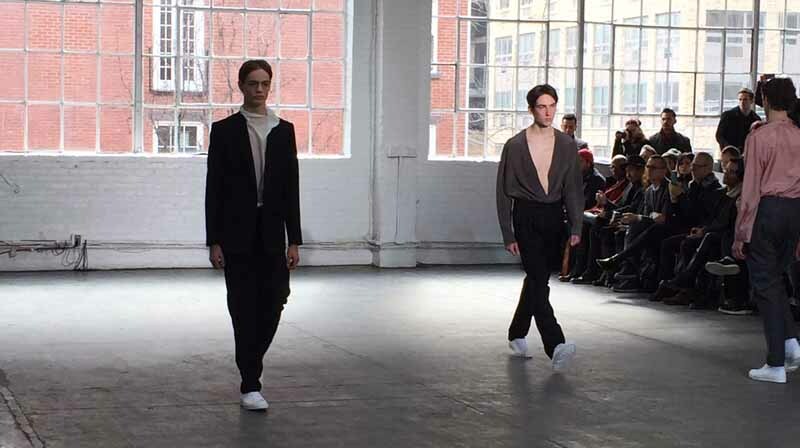 Cryptically titled “Tomorrow”, the Duckie Brown Fall 2015 collection is for the elegant modern man. With black, blue and grey as main colors, pink was interspersed for color. Tailored and with a perfect fit, this Duckie Brown collection is sure to catch the attention of Millennials to Gen Xers.